After attending Eton Stoneman’s session at Techorama in the Netherlands I decided to have some fun with SQL Server Containers on Windows. 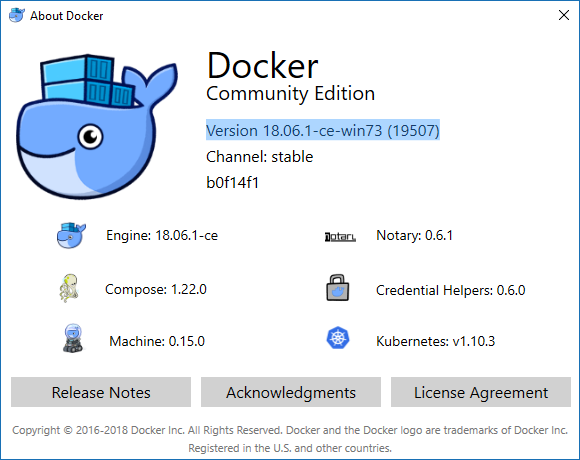 The first thing I did was install the latest version of Docker for Windows. As of this post I was using Version 18.06.1-ce-win73 (19507). With Docker ready, I pulled the image with the 2016-sp1 tag to play with. That command might take a while as the image is very big. Once the image is pulled you can start spinning up SQL Servers. If you are not using PowerShell just issue an inspect command and find the IP Address in the JSON returned. 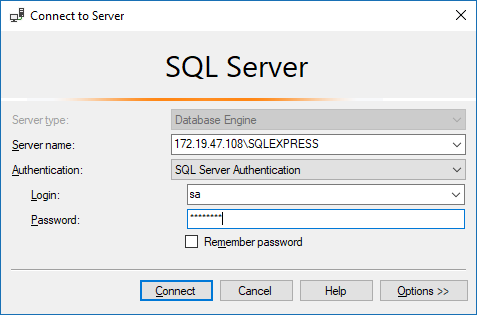 With the IP Address open SSMS and enter in the IPAddress followed by “\SQLExpress”. Switch the Authentication dropdown to SQL Server Authentication. Enter “sa” as the Login and the password used during the run command. 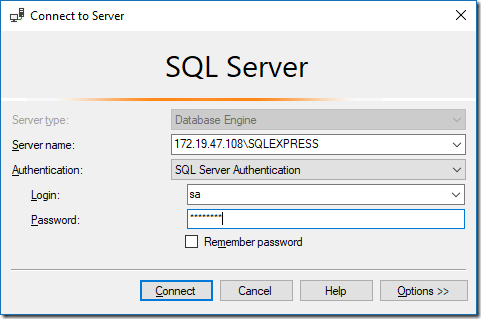 Clicking Connect will connect you to your new instance of SQL Server! If you want to run multiple instances of SQL Server on the same machine, simply update the port mapping in the run command. For example, the command below will start a second instance for SQL Server with a container port of 1466. When connecting with SSMS you still only need to provide the IP Address. You do not have to provide the port. During my testing trying to provide the port SSMS would fail to connect. Using SQL Server in a Docker container opens up a world of possibilities when it comes to creating datasets for integration testing and testing schema updates. In this post I show how to get started with SQL Server containers running on Windows. Docker images for Windows containers are usually bigger in size. I tried to use the Linux versions mostly due to its lightweight images. I built a demo app with SQL Server 2017 Linux as database in a multipart series which also showcased the capabilities of Azure Kubernetes service for deploying the containers on cloud. As part of this series we also looked at advanced concepts like state management using Persistent Volumes and Persistent Volume Claims, Azure Disk based storage and secrets management.